The emperor Guangxu and the dowager empress had both died that week. My mother told me our new emperor was a little boy of almost three called Puyi. A child less than half my age now ruled China and she was praying for him. And for us. My mother knelt, eyes shut, rocking back and forth with clasped hands. I couldn’t hear the prayers she murmured and did my best to imitate her, but I couldn’t help lifting my eyes to steal glances at the picture pasted on the brick wall, a colorful print of a woman dressed in flowing silks, her face sweetly bland, one hand lifted in blessing. A large red fox sat by her feet. A Fox spirit, pictured in her human and animal forms. The altar was just a low table placed against the back wall of the kitchen. Its cracked wooden surface held an earthenware jar filled with sand. My mother had let me poke our last handful of incense sticks into the sand and even let me strike a match to light them. We had no food to offer that morning except a few withered plums. We lived by ourselves, just the two of us, in the main house of the Western Residence. I usually slept with my mother in her bed, but I was just as used to spending nights in my playroom. It was out in the erfang, a single-story row of five connected rooms, each with a door that opened onto the veranda that wrapped around the front of the building, steps leading down to a paved courtyard. There were two erfang that faced each other across the courtyard, but the other was derelict, its roof fallen in. Whenever Noble Uncle came to visit my mother, I had to leave the main house. She would send me to my playroom and fetch me the next morning after he left. Then our placid life would resume. Sometimes Noble Uncle took her away for a day or two, but never for this long. On the first day of my mother’s absence, I paged through the few books in my playroom, then wandered out to the courtyard to shake more plums from the fruit trees. I pulled off their desiccated flesh and put the pits in my pocket. Using the charred end of a stick from the kitchen stove I drew a checkers board on the paving stones and placed pits in the squares. Morning and afternoon I shook the trees, hoping more fruit would fall so that I could have more pieces for my game. After two days, I began eating the plums despite their moldy taste. But mostly, I watched and waited for my mother to return. The smaller front courtyard had gates that opened out to Dragon Springs Road. Years ago my mother had pushed broken furniture against one corner of the courtyard’s walls, tying wooden legs and chair backs together to steady the stack into a platform we could climb. From this perch we had spied on the world outside. The honeysuckle that clambered across the top of the wall was bare of leaves, but the tangle of vines was still thick enough for concealment. Looking down to the left, I could see the front courtyard of the Central Residence, the home where Noble Uncle and his family lived. There was a door in the wall between the two front courtyards, but the only one who ever used it had been Noble Uncle. To the right was the street. Standing on tiptoe I peered through the vines, hoping to see my mother’s figure alight from a sedan chair or rickshaw, but all I saw were our neighbors, unwitting and uncaring of my presence. Back at the Fox altar I knelt down to pray, rocking on my haunches, gaze fixed on the picture pasted to the wall. My nostrils prickled with the musty fragrance of incense. Please, bring back my mama. But the Fox woman looked into the distance, and the Fox merely smiled. Now I wondered at my mother’s words. Did she pray to a Fox because she was an unfortunate woman? 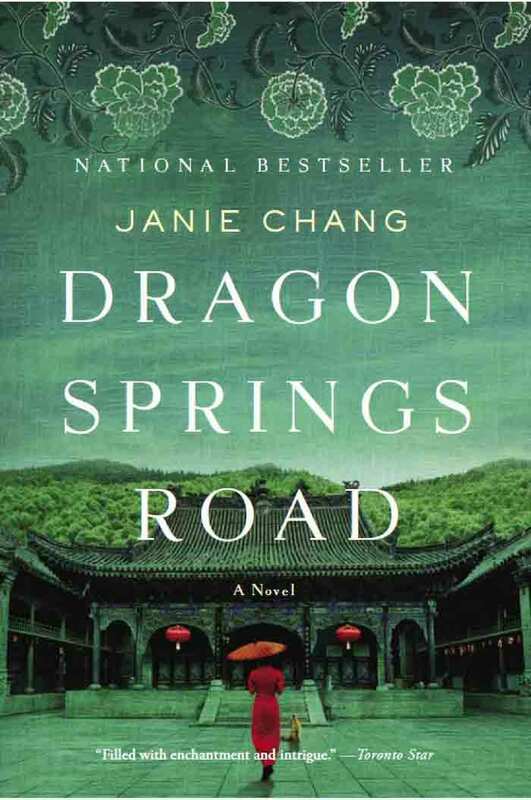 That night I dreamed that I had wandered out to Dragon Springs Road all on my own, when a dreadful knowledge seized me that my mother had gone away never to return. Fear jolted me out of sleep and into the gray light of early morning. I was utterly alone. I cried and cried, but my forlorn wails went unheeded. Curling up under the quilt, I sobbed myself back to sleep. The next morning, I lay on the pallet bed with all my clothes on, quilt pulled over my head, trying to keep warm. The plate on the floor taunted me with reminders of chicken and sticky rice steamed in lotus leaf packets, the scent of garlic and sesame oil still clinging to the leaves. My stomach ached, a harsh kneading that twisted my insides. I tried chewing on a lotus leaf, but when I tried to swallow, the tough fibers made me retch and I spat them out. Finally, I went outside to get a drink from the well in the courtyard. I knelt beside its low stone wall and pushed aside the wooden lid. I tossed in my tin cup, heard it splash in the dark depths, and pulled on the rope, hand over hand as my mother had taught me. I took care not to lean too far over the stone rim, as she’d always cautioned, and replaced the lid. I didn’t want to end up as the ghost of a drowned girl, dank hair hanging over my face, luring victims to share my fate. It won’t be long now, a voice behind me said. People are coming. I can hear them up the road. The voice was high pitched, the words pronounced precisely. I swung around. An animal with tawny red fur yawned, showing a pink tongue and sharp white teeth. It looked like one of the stray dogs that sometimes came into Dragon Springs Road, but it was sleek, not mangy, with a plume of a tail. A fox. Its eyes shone amber yellow, dark centers with flecks of green in their depths. Its snout was long and elegant, its paws neat and stockinged in black. Then it vanished. Startled, I dropped my cup and toppled over, my back against the well. Had I fallen asleep and dreamed the creature? Then I heard voices. Unfamiliar voices. Voices shouting commands, voices shouting in reply. I hurried through the bamboo grove to the front courtyard and climbed up the pile of furniture. Next door, the gates stood wide open . There was excited laughter and chatter from the street, and then a woman’s voice called out in stern tones. A man stepped over the threshold of the entrance gate. An exuberant smile lit his round face. His long queue gleamed with the same dark shine as his satin skullcap, and he carried a bundle of books under his arm. The old woman by his side wore her white hair scraped severely into a bun, her forehead covered by a wide band of black silk. She carried a pair of scrolls and tottered in on tiny feet. Then two younger women stepped into the entrance courtyard. One had a rounded, smiling face and a rounded belly; she held a basket of fruit against her hip. The other was tall and pale, with pursed lips that gave her a dour expression; a panel of embroidered fabric hung over one thin arm. A young man and a girl followed. The young man carried a small lacquerware box, the girl a covered basket. She was tall, nearly as tall as my mother, with hair dressed in two heavy braids looped with ribbons on either side of her head, glossy and thick. Her padded winter tunic of dark blue flannel just reached her ankles. Then came a female servant holding a little boy by the hand. Two more female servants entered, gazing around and up, but they didn’t see my face peering from behind the vines. The servant who had first spoken pushed the entrance gate open wide and wheeled in a barrow. On the barrow were gardening tools and a small orange tree, its root ball bound inside a muddy burlap bag. The small procession crossed through the inner gate and into the main courtyard. More handbarrows and workers followed, loaded down with furniture and belongings. My mother wasn’t among those parading in and out. Back in the courtyard, I shook one of the plum trees at the edge of the bamboo garden. Four aged fruits fell from its branches. I scooped what I could into my hands and ate it all, not caring about the grit that covered the plums. I spat out the pits and arranged them on my checkerboard. A scraping noise sent me scuttling into the playroom, the sound of the gate between the two front courtyards opening. I waited, kneeling by the window. Through the carved latticework of the window shutters, I saw a figure enter the courtyard. It was the girl. For a moment she vanished from sight as the path took her through the bamboo trees, then she appeared again, following the path through the rockery and under the garden arch. She took her time, pausing to look at a rock, a striped bamboo trunk, the carved stone of the arch. She gazed around the courtyard and the buildings that enclosed it, the two-level main house at the far end of the courtyard, the erfang where I was hiding, the derelict erfang opposite, the bamboo garden she had just come through. She climbed the steps to the veranda of the main house and peered through the carved lattice windows, into the rooms where my mother and I had lived. Then she walked back down the veranda steps and paused to look down at the plum pits lying on the makeshift checkerboard. Show yourself to her, the voice said. I blinked at the Fox who had appeared beside me. I reached my hand out to touch, to feel whether it was real. The creature gave me a small lick, a raspy warm sensation that gave me courage. Your mother burned incense to a Fox spirit, it said. Don’t you remember? She gave a small bark of disdain. How can you tell whether anyone is truly good or evil? I’ve been a Fox for hundreds of years and from what I’ve seen it takes generations before consequences truly run their course. This answer made no sense to me, but her next suggestion did. Go to that girl. She’ll give you something to eat. “My mother said not to let anyone know I was here,” I said, but my words of protest were feeble. The hollowness in my stomach mattered more. In response, the Fox nudged me toward the door. Closer, the girl’s eyes were the first thing I noticed. Her looks were unremarkable, smooth flat features on a plain face. But her eyes were large and deep-set, solemn and serene. I shook my head. My mother had never mentioned any ghost. “Have you seen my mother?” The question tumbled out, more important than food. “Why didn’t you go away with her?” the girl asked. I had asked myself this question for days and could only look away, unable to answer. “Zhu. I think.” How could I have been uncertain of my own name? My mother had never made a family name seem important. She only ever called me Jialing. My little Ling-Ling, she sometimes teased, like the sound of a bell. Anjuin held her hand out and I took it. My fingers were cold and rather sticky, but Anjuin’s grip was firm, and her eyes as she looked down were clear and kind. My wariness dissolved, and when she squeezed my hand, I squeezed back. As we left, I heard a rustle in the bamboos. A small note of caution from Fox sounded in my mind, warning me not to mention anything about a Fox spirit to anyone. And behave yourself, the voice added. Be good and make it easier for them to let you stay. “You must call her Grandmother Yang,” Anjuin whispered. As soon as we entered the Central Residence, Anjuin sent a servant ahead to tell her grandmother. I followed Anjuin to the main house, where we entered a room on the ground floor. Members of the household were already gathered, all talking at once. I’d never seen so many people in one place before. I clung to Anjuin’s hand. “She’s an unlucky omen,” the other woman replied. She seemed much older, or perhaps it was her thin figure and dour face, her look of discontent. When I glanced up timidly, she glared at me. Anjuin led me to the far end of the room where an elderly woman rested on a daybed. The round-faced, jovial man stood beside her, but it was the old woman who commanded my attention. She beckoned, and Anjuin gave me a small push. Grandmother Yang’s face was gaunt, papery skin pulled tight over her cheekbones, fine wrinkles around her eyes. She had the same eyes as Anjuin, alert and deep-set. Her trousers and tunic were of plain fabric, a row of black knot buttons the only ornamentation across her dove-gray bodice. There wasn’t a hint of needlework on her wide cuffs. Then I noticed her tiny shoes, which dangled on feet that didn’t quite touch the floor. They were red satin, lavishly embroidered. The dour-faced woman hurried over from the doorway, a handkerchief held out in her thin fingers. Grandmother Yang dipped the cloth into a cup of cold tea on the tray beside her and wiped my face. She looked at me again, more closely. There were gasps. First Wife hissed. It seemed as though the entire room crowded around me, turning me around to stare, to prod, and exclaim. I didn’t know what zazhong meant. Only that suddenly my presence caused fascination. And disgust. Unbalanced, the woman staggered back on her tiny feet and fell onto the daybed with a cry. The blow sent me to the floor, but I refused to make any noise. I glared at her, ready to launch myself again. Orphanage. Zazhong. Whore. New words. The servants talked over my head, giving me curious glances, but all that mattered was the large bowl of warm soy milk that the cook, Mrs. Hao, had set down in front of me. According to Mrs. Hao, Master Yang wanted to send me to an orphanage. Grandmother Yang, however, was intrigued by the mystery of my identity and inclined to keep me a bit longer. Lao-er, the gatekeeper, said Master Yang always deferred to his mother, so my fate was up to Grandmother Yang. The other two obediently filed out of her domain. I finished the soy milk, and Mrs. Hao paused from stringing beans to hand me a steamed bun. It was warm, filled with minced pork and salted vegetables. I’d never tasted anything so delicious. “It’s a place for children without parents.” A short reply, but not unfriendly. “What’s a whore?” And what did it mean if my mother was one? Foreign was the metal box my mother used for storing her cosmetics, the lid printed with a garden scene. Foreign were the thin wafer biscuits she sometimes gave me when she returned from the outside world. I didn’t know foreign could be a person, let alone a father. This time, I only had to face Grandmother Yang, Master Yang, and the eldest son, Dajuin. Anjuin stood behind me, a hand on my shoulder. No, no. My fingers clenched. I had to stay here. Otherwise, how would my mother find me when she came back? I wanted to protest, but Fox’s warning growled in my head and restrained me. “What have you learned from the neighbors?” Grandmother Yang asked. She pulled it over my head. I shivered in my thin undershirt and moved closer to Anjuin. “It’s silk, isn’t it, Grandmother?” Anjuin said, rubbing the fabric between her fingers. My mother had cut down one of her own jackets to sew me this winter tunic. It was silk crepe, green as her jade earrings and printed with bronze chrysanthemums. She had spent days embroidering a garland of chrysanthemum leaves on the cuffs and collar. Grandmother Yang picked apart the hem with small embroidery scissors. I shook my head, watching as the old woman picked open several inches of hem. She put down the scissors and drew out a narrow sash of unbleached cotton. On one side was a string of characters stitched in black thread. Grandmother Yang handed it to Master Yang, who read the words out loud. I entrust my daughter to your care. These coins should be enough to buy her many years of rice. May the Buddha bless your kindness and reward you in this life and the next. Basting stitches across the cloth, each a few inches apart from the other, made a series of pockets. Grandmother Yang slit open the sash along its seam. As her scissors ripped through each pocket, a coin fell on the daybed. Ten in all. In that moment, I finally understood. My mother had abandoned me. The realization slammed into my ribs, knocking the breath out of my body. I tumbled through air as thick as ink, as bottomless as the well. When I stopped falling, I was back in the Western Residence. But it wasn’t early winter. The fruit trees were in bloom, their branches a froth of pink and white. The main house and erfang houses looked well kept, newly whitewashed, the carved wooden panels on all the verandas varnished. The gray tiled roof of the second erfang was whole, not caved in, and the lattice windows on all the houses were fitted with clean white mulberry paper panes. A woman’s figure by the door of the main house made my heart jump, but it wasn’t my mother. Her clothing was strange to my eyes, not the long tunic and trousers my mother wore, but a short jacket with loose sleeves and a softly pleated skirt of light silk that barely touched the ground. She floated toward me, a slender figure in autumn colors, swaying on tiny feet encased in gold satin. The shadow she cast was that of a Fox. As she came closer, I saw that she was beautiful, her chin small and pointed, her forehead wide. Although her skin was as pale and unblemished as a newly opened lotus, she gave the impression of being much older. Her eyes gleamed amber, a dark glow with green lights in their depths. This is how it looked three hundred years ago, Fox replied, when I was a much younger Fox. Whatever I’d done, if only someone would tell me, I would never do it again. You didn’t do anything wrong. You must believe she left you behind for a good reason. What matters is that you survive on your own in this world. She sat on the stone bench at the edge of the rock garden and took both my hands in hers. Her hands were slim and neat, the fingers pointed, the nails long. Clusters of bright blue butterflies bobbed on gold wires above her elaborate hairstyle, ornaments of kingfisher feathers. Your first duty is to please Grandmother Yang. Whether you stay or go is her decision. I can only do so much, so you must be obedient and help things along. The courtyard spun around me; petals of plum blossom drifted up in a slow, dizzying swirl. I fell back into darkness and heard Fox’s answer, so soft it might have been no more than the rustle of bamboo leaves. When I opened my eyes, it was Anjuin who held my hands. I lay on Grandmother Yang’s daybed, propped up on pillows. The room was empty. She smiled, and a small kernel of hope planted itself in my heart. I could stay. I would not be sent to an orphanage. If Mama came back, I would still be here. Looking around the room again, I climbed down from the bed to stand in front of a low dresser and the mirror propped above it. I knew what I looked like, of course. I’d looked into my mother’s hand mirror often enough. Now I stood in front of Grandmother Yang’s mirror, and Anjuin came behind me. Her hair was thick and black, sleek as lacquer. My hair looked black, but out in the sunlight I knew it was wispy and dark brown. My eyes were a lighter shade than hers, and my eyelashes curled up while hers were beautifully straight and sparse. Beside her, my skin looked sickly, too pale. Her eyebrows were curved, each a perfect willow leaf, the exact shape my mother used to paint her brows. Mine were straight across my brow. Was I really so different?